Be yourself. Don’t try to become someone else. 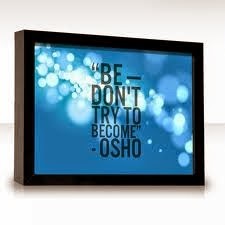 Drop the urge to “become” and simply “be”. That’s Buddhahood. Gautama, the Buddha, himself has said this: “Doubt everything. Find your own light.” What this means is that you shouldn’t get carried away by others’ experiences or philosophies. You have to challenge every assumption, question every logic, convince yourself how (your) Life works and accept your own convictions and beliefs. But this is not the way we have been raised. Everything we do is what we have been “told” to do. There’s very little scope or opportunity to make our own music, pave our own paths and to live our lives as if we were explorers and not followers. Which is why, when you fare badly in academics, you are condemned. I, for example, was thrown out of school and that led to my parents feeling “embarrassed” on my account – their feeling so changed my Life forever. Society’s expectations from us are far removed from the way the Universe works or has planned things for us. According to the Cosmic Design, everything is in its place and everything’s perfect. The Master Plan has no flaws. Society – family, friends, community – says, however, you are not good enough. You must be this way or that way or like him or her. If you succumb to this pressure, you give up being who you actually are. You get trapped in the “becoming game” – wanting to become something that you are either not capable of or interested in becoming – instead of simply being. If you accept who you are, if you stop wanting to become (something, someone) and simply be, that’s Buddhahood. This is not at all complicated. Simply ask yourself what gives you joy and go do it. You can keep your job, do whatever else you have to do to discharge your “worldly” responsibilities, and still if you can devote some time to do what you love doing, you have made progress. Doing this, now that you have experienced inner joy, keeping doing more of that stuff. When you do more and more, and then eventually do only that which gives you joy, then you are yourself! You are not trying anymore to become someone else for society’s sake, for family’s sake or for money’s sake. When you live the Life that you enjoy living, that’s Buddhahood. The Lotus Sutra is the most profound scripture in Mahayana Buddhism. And the defining doctrine in it is the belief that all people can reach an enlightened state. The key to this enlightenment, as I have learnt, is to drop all notions that your Life is imperfect and that you have to do something, become someone else, to make it perfect. Just accept your Life the way it is, accept yourself the way you are, don’t judge, don’t reject, don’t condemn, don’t try to become. Experience everything. Then choose what you love doing. And then keep doing that. Just being yourself. In your acceptance of your Life the way it is and of yourself the way you are lies you Buddhahood – and your bliss!